This recipe was a revelation. I grabbed a few young nettle leaves from the allotment, blanched them (very important as this gets rid of the sting!) and bashed them up with some oil, garlic, pine nuts and parmesan, and hey pesto! It made enough to feed two with spaghetti, but you could easily make more and keep it in a jar covered with oil in the fridge and it would probably last a week or so. You’ll need to wear gloves when harvesting/prepping the nettles, and feel free to adjust any of the quantities according to taste. 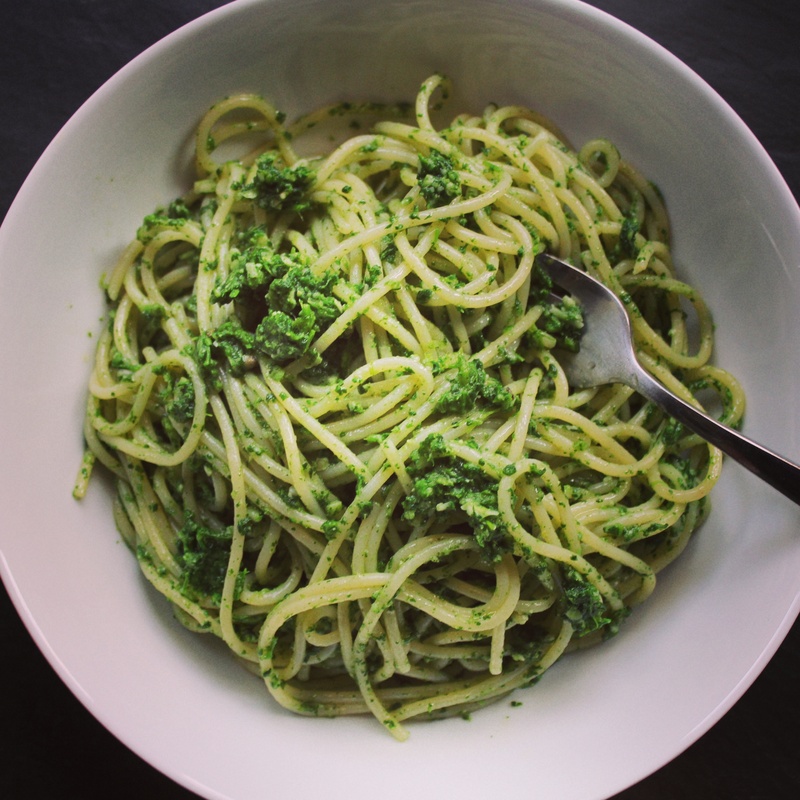 The following made quite a gutsy pesto, absolutely delicious and so full of vitamins and iron! Bring a pan of water to the boil and blanch the nettles for 1-2 minutes before draining and plunging into iced water to stop them cooking. Meanwhile, crush the garlic and grate the parmesan cheese. Drain the nettles and squeeze out all the water you can. They’ll have lost their sting by now. You’ll be left with a small ball of green. Chop finely. Place the garlic, cheese and nettles in a large bowl and pour over the olive oil. Pound thoroughly with the end of a rolling pin. Add the pine nuts and a squeeze of lemon juice before giving the pesto another good pounding. I added some freshly cooked spaghetti to the bowl and tossed everything together before serving, but you can do all sorts with the pesto: spread it on bread or pizza bases, coat meat with it. You can easily make it in a blender or with a pestle and mortar if you prefer. Been thinking of munching some nettles. This could be the way to do it. Looks delish. I’ve just chopped up acres of nettles to add to the compost bin. It’s full to the brim now with weeds and grass interspersed with nettles to get it going fast-ever hopeful.